In the months immediately after the World Trade Center attacks of September 11, 2001, New Yorker Ranya Idliby’s first-grade daughter came home from school and asked her mom whether they celebrated Hanukkah or Christmas. Idliby, an American Muslim of Palestinian descent, decided then and there she needed to figure out a way to teach her children about being a Muslim in the United States. She knew Suzanne Oliver, an Episcopalian from the Midwest, because their kids attended the same school. At the bus stop with their kids one morning, Ranya asked Suzanne if she’d like to work together to write a children’s book about the three Abrahamic religions: Judaism, Christianity, and Islam. Suzanne, eager to participate, invited Priscilla Warner, a Jewish woman, to join them. These three women—all moms and writers—began to meet biweekly at Ranya’s Manhattan apartment, always with some sort of food. The format was flexible and “organic…Whenever someone had a particular subject she wanted to discuss, she was free to call a meeting and set the agenda for that meeting” (1). As the women began work on the children’s book, they began to realize that their meetings were valuable interfaith exchanges. Their meetings were evolving into “something sacred, something we began to call our ‘Faith Club'”(2). What started as a children’s book project became The Faith Club: A Muslim, A Christian, A Jew—Three Women Search for Understanding, published in 2006. 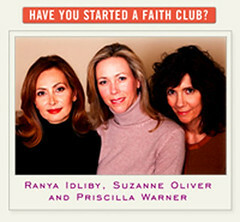 The Faith Club is a memoir by three women, written in the first person, interspersed with verbatim excerpts from their tape-recorded conversations. The trio writes about their interfaith dialogues from the fall of 2002 until the end of 2004. The book, in turn, has inspired other women who have organized their own local faith clubs. Some of these groups are formed online, through the book’s website: www.thefaithclub.com. Priscilla is quite frank about her experience in The Faith Club: “I’m not a historian. And I’m not a politician, a political scientist, a theologian, or a peace negotiator. My story is just the story of how I met Ranya and Suzanne and how they changed my life and the way I look at things” (3). Ranya is awed by the ease of their conversations: “What I still find incredible about the Faith Club is the ease with which our dialogue flowed…it became difficult to imagine life without it” (4). For Suzanne, being a part of these conversations was a “life-changing experience that showed me we’re just not all that different” (5). Long before the women became co-authors, the three women had their first meeting to plan their interfaith children’s book. Each woman arrived excited about the project, but nervous about each other. As these early meetings unfolded, the women grew more comfortable with one another and their conversations drifted to points of agreement and disagreement between their religious traditions. Both Priscilla and Suzanne were startled to hear Ranya describe Islam’s openness to both Christians and Jews—to all “People of the Book” (6). Ranya explained even further that, “Muslims are required to believe in the Gospels and the Torah. Your God is the Muslim God, too” (7). Priscilla and Ranya learned they had grown up with similar children’s books about Abraham, Adam and Eve, and other shared stories. Suzanne exclaimed, “Muslims believe in the Gospels and the Torah? Our religions were closer than I had ever thought. It was thrilling” (8)! The three women were happy with how these first meetings went, each on a sort of high about the discussion and its potential. For each, The Faith Club quickly became “addicting.” Suzanne says she “kept coming back to our meetings because [she] was hooked” (9). Ranya, offering advice to other faith clubs, encourages: “Trust me, you will soon find yourself addicted to the dialogue” (10). On their study guide for groups reading The Faith Club, Ranya, Suzanne, and Priscilla reiterate that “honesty was the first rule of The Faith Club, and with that tenet as a foundation, no topic was off limits” (11). With such a commitment to honesty, conflicts were destined to arise. And they did—over Palestine, over anti-Semitism, over Christianity’s majority position in the US, over Islamophobia in the West, and over Israel. These conflicts between perspectives and beliefs proved fruitful for The Faith Club. Priscilla, in an interview with the New York Post, explained, “‘A lot of sparks flew in that room…But when you put all your worst fears and prejudices on the table and really talk honestly, you come out of it incredibly open and spiritually alive'” (12). One of the pieces of positive feedback the group has received, Suzanne reports, is from interfaith groups who find it “refreshing” that these three women did not shy away from controversial issues (13). From the start, like many women-led interfaith groups, The Faith Club’s interfaith dialogue was intertwined with stories about their family lives, personal histories, and their own faith journeys. Ranya explained, “There honestly was no shortage of material. Life was our abundant source, overflowing with questions, fears, and aspirations” (14). Each woman entered The Faith Club at a different point in her own religious journey and each woman’s understanding of her tradition has been affected by her participation. In 2001, Suzanne was quite comfortable in her Christianity. She was happy in her Episcopalian congregation, attended church services regularly and taught Sunday school. To her surprise, The Faith Club raised difficult questions for her. She began to wonder how she could affirm Christian understandings of “death, heaven, Jesus, and salvation” in light of her new-found desire to affirm Ranya’s and Priscilla’s religious commitments. After three years of conversations with Ranya and Priscilla, Suzanne described herself as more open-minded in her approach to Christianity: “My God hasn’t changed,” she explained, “But maybe my doctrine has” (15). Priscilla began her conversations with Ranya and Suzanne as a proud Jew. She attended synagogue on Holy Days, but Priscilla was far less certain about God. The attacks of September 11, 2001 threw her into a spiritual crisis—where was God then? Priscilla described Suzanne as “the midwife to [her] faith” (16). Suzanne and Ranya offered their Jewish friend different ways of seeing God—in people’s kindness, in their children. Ranya started The Faith Club “with doubt and insecurity about Islam,” she explains, “and ended up a more committed and confident Muslim” (17). Because of encouragement from Priscilla and Suzanne to find a mosque that fit her spiritual needs, Ranya found Imam Feisal Abdul al Rauf and the American Society for Muslim Advancement. Abdul al Rauf, and his wife, Daisy Khan, affirmed Ranya’s interfaith work and her identity as a Muslim woman who does not wear a headscarf. Ranya also explained that The Faith Club helped her “get in touch with my own faith…I learned Islam is a peaceful religion that I can be proud to give my kids” (18). Being a part of The Faith Club inspired each woman to learn about her Abrahamic counterparts, but they also found “greater clarity in their own” traditions (19). From the very personal space of their own journals, the comfort of Ranya’s living room, and growing friendships, the three discussion partners decided to move their conversation into the world. Four years after their first meeting, they published The Faith Club. Suzanne reports that they have received an “overwhelmingly positive response.” The book is currently in its third printing and has “sold beyond expectations.” Over the last years, The Faith Club has been on book tour around the country and its authors have heard many stories about how their experiences in the book are impacting faith communities. One church library in Hartford, Connecticut, bought twenty-five copies of the book for their congregation. A Catholic college professor assigned the book in class and had students write their own reflections on their faith traditions. The continuing education department at Princeton Seminary is interested in using The Faith Club model and book in curriculum design (20). But the primary market for the book, according to Suzanne is probably women’s book clubs. Interfaith groups like Women Transcending Boundaries are selecting The Faith Club for their book discussions. Suzanne estimates that about 80% of the attendees at their speaking engagements are women (21). Many of these women are either members of or interested in starting their own faith clubs. Outside the US, The Faith Club has toured in Oman. They presented to a group of Muslims at the Young President’s Organization annual conference, the topic of which was “Culture and Diversity.” One attendee, a man from Saudi Arabia, told Ranya he was so happy she was spreading an understanding of Islam in the West that is open-minded and interested in interfaith dialogue (22). Up until the summer of 2007, the book tour had a traditional format—the three women took turns talking about their perspective as a co-author and then the audience asked questions. Now the three women are trying a different type of presentation that is a book discussion by the participants with Priscilla, Suzanne, and Ranya facilitating the discussion. Encouraging this kind of participatory dialogue is important to the ongoing mission of The Faith Club. The co-authors introduce their book by inviting readers to “eavesdrop on our conversations” in the hopes that “perhaps when you’re finished, you will want to have a faith club of your own” (23). The authors offer many tangible resources for doing so. The last ten pages of the hardcover edition of the book are filled with “how to’s” for starting faith clubs. Suzanne, Ranya, and Priscilla offer tips like “keep a journal,” “be honest,” and “bring life experiences to each meeting” (24). They also include suggestions for further reading and lists of questions for jumpstarting faith club discussions—questions about stereotypes, personal reflection questions, and questions about the Holy Land, Holy Texts, prayer, and religious holidays. The forthcoming paperback edition (Summer 2007) of The Faith Club is “more geared to reading in a group,” says Suzanne. This edition includes a reading guide in English, Arabic, and Hebrew and a “Q&A” with the authors (25). The website is also full of ideas for how to start a faith club. The authors have put together “faith club kits,” posters, tips on getting started, and resources about each faith tradition. The three authors also maintain a blog, encouraging people around the country to be involved in interfaith discussions. In response, almost sixty women have posted calls for starting faith clubs on the “Sign Up Board” (26). For example, Kelly in Connecticut writes, “I would be interested in starting a club in Southern Fairfield County. Please feel free to email me if you are local and interested” (27). Additionally, the members of The Faith Club invite people to start online conversations using “myspace.com” as a forum for dialogue. As of June 2007, an online group based in Cincinnati, Ohio, has formed and a woman in Ellensburg, Washington, has just started a forum for women in her area. And the children’s book? Suzanne reports that they are still working on it (28)! Ranya, Suzanne, and Priscilla have received extensive news coverage. They have appeared on the The Today Show, CNN, and The Diane Rehm Show, to name just a few. From The New York Times and USA Today to The Providence Journal and Kansas City Star, news about The Faith Club is spreading around the country. For a full listing of news coverage, visit The Faith Club’s press page. 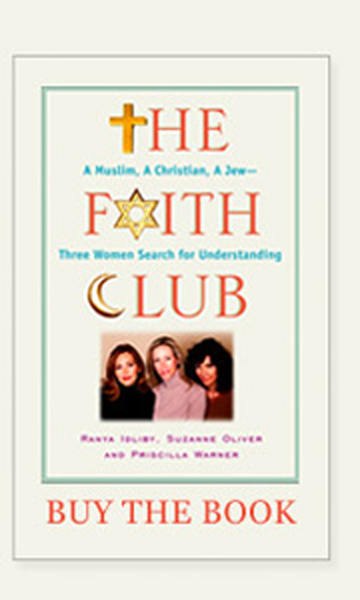 (1) Ranya Idliby, et al., The Faith Club: A Muslim, A Christian, A Jew—Three Women Search for Understanding, (New York, NY: Free Press, Simon & Schuster, Inc., 2006), 124. (4) Idliby, et al. “The Faith Club Reading Group Guide,” 8. Accessed online at: http://www.thefaithclub.com/thebook/readinggroup.php (30 June 2007). (5) Angela Montefinise, “Face-to-Faith.” New York Post. 1 October 2006, (26 April 2007). (9) “The Faith Club Reading Group Guide,” 15-16. (10) “The Faith Club Reading Group Guide,” 15. (11) “The Faith Club Reading Group Guide,” 1. (13) Suzanne Oliver, Telephone Interview by Kate Dugan, Cambridge, Massachusetts, 16 May 2007. (14) “The Faith Club Reading Group Guide,” 8. (17) “The Faith Club Reading Group Guide,” 5. (19) Cathy Lynn Grossman, “Moms Find Spiritual Friends in Faith Club,” USA Today, 27 September 2006, (26 April 2007).